There comes a point in your life when your time and energy can’t be wasted. You’re not looking for more email or more noise or more stuff. You’re looking for connection, meaning, and ideas to help you along life’s path. That’s the kind of community we’re trying to create here at LearnDoBecome. And today I’d like to walk you through the broader vision Eric and I have been working on. My hope is that you’ll be as excited about this vision as we are (recognizing that it’s a work in process!). If you’re already inside our Steps to Everyday Productivity program (STEP), you’ve got this part. That’s why we held STEP LIVE last month. That’s why we teach our productivity classes. (Click here if you haven’t attended one yet!) I love this because when your mind and life are in order, big things are possible. Would you not feel amazing if you could transform your space like that? It’s totally possible for each of us. This is where Life Architecture comes into play. It’s a blueprint and a map so you know what you’re building and where you’re going–in your personal life, your family, and your profession. Tell Eric that we came home and did the start of our 50-year plan and discovered to my shock that after this Christmas, because of (church/humanitarian) missions overlapping, our little family won’t be fully together again until 2022. I had no idea! It has made us rethink our whole plan for Christmas. Looking forward–beyond today’s urgent needs–gives us the opportunity to treasure the moments. 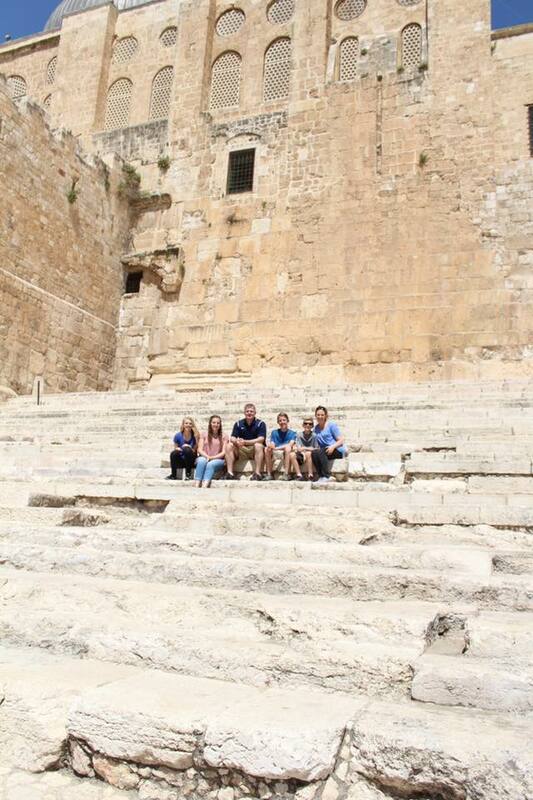 On a personal level, when I was expecting our first child, Eric had an opportunity to go to Israel with a group of students from colleges around the country. He promised he would take me someday. But Eric put it into our 50-year plan. And we saved, worked, and prepared for that trip for years. And when we took our four children this past spring, it was literally a dream come true. Traveling, creating a beautiful home, and having fun with your friends and family are great goals. Don’t get me wrong. But Eric and I love the word “stewardship.” Because ultimately, the work you and I are doing is not about us. If you could get your life in order and have more discretionary time, what would you do to help other people? And can you just feel the energy in this one? As we’re doing our work and reaching out to help others, we want to wake up excited each day and then go to bed content. We want to know with an absolutely certainty that the course we are following will improve our lives. Making that decision is obviously an important step, but what about being part of a community that supports you in getting results? Helping you Learn, Do, and Become is our life’s work, and we’ll do everything in our power to serve you well. ***If you’re new here, we’d love for you to sign up for our free audio and PDF, Five Life-Changing Habits Most People Overlook. It will connect you to us so you’ll get future updates, and you’ll want them! Great things are coming. And if you want to add your voice to this conversation, will you do us a favor? Leave a comment here on this post! It is way better than emailing–because it opens a community conversation where everyone can participate. We’ll personally respond to as many comments as we can. We’re grateful for you. More than we can say. And we thank you in advance for all the fun we’re going to have together. I love it. For those of us who have to see it, touch it, hear it and FEEL it to learn it well, this is perfect. Thank you so much!!!! So glad you’re with us, Pamela! Honestly, I feel like this community is a gift for ALL of us–each member brings something so beautiful and unique. Much love! I’m so thankful for your vision and inspiration. I’ve felt like I’m drowning in all I need to get done. I signed up for your Mastery program a long time ago and started but didn’t get very far. I KNOW that if I will focus on doing the assignments in the program, that my life will feel more in control again and feel less overwhelming. Thank you again for your example, love, support and encouragement! Rebecca, you are in the right place! You WILL feel in control again. We’ll help you! Thank you for your kind words and for being with us here! Paula, We are so glad you are finding hope moving forward towards your goals and dreams! 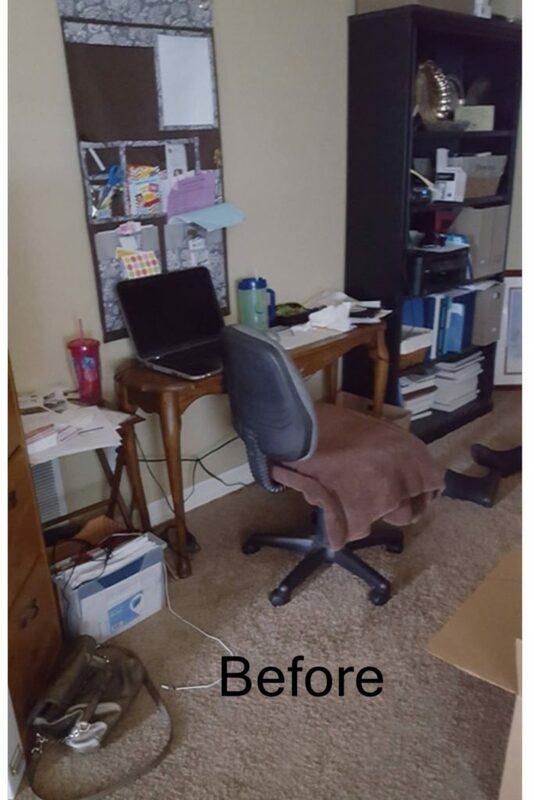 You have great things ahead of you, and we would love to see a before and after picture of your progress in your command central! Have a great week! Sending Big Hugs your way from a fellow Mississippian and baby boomer. My husband just turned 59 on October 1st. He waited 33 years for me to clean up my act, and I’m still working on it. My mother and father grew up during the Depression and left behind nearly 70 years worth of collections from their marriage (highschool sweethearts.) Mom also struggled mightily with her health and weight, as did my siblings, which kept them from being able to address their organization needs. Vicious cycle. Two years ago I found the Bright Line Eating program for those susceptible to flour and sugar addiction, and reversed my own downhill health trend (50 pounds and seven dress sizes lighter.) This year I was led to the STEP Mastery Program, and have made tremendous progress in lightening the load in my home!! Before that, I was studying the works of Florence Scovel Shinn, and she emphasized the importance of not hoarding or saving for a rainy day, lest it violate the “Law of Use” and take up space without a clear, definite plan of action. STEP is the answer to my prayers. WE GOT THIS!!! I’m reading this on your birthday. I wanted to reach out and encourage you! How do you want to feel about yourself, a year from now, when you are 60? If you take baby STEPS and intentionally design a year to get there, I’ll bet you start feeling it way before next October! This sounds wonderful April. I think it will help and inspire many, including myself! Im excited to see more on this. Thank you for all you and Eric do to serve and lift others as you figure out your own purpose and journey. I love that, Jodie. And I totally agree. When you feel there is “something more” calling to you, it is SO important to listen. People need you. And exciting things are ahead!! I imagine (and hope) you’re going to tell us more about how to make a 50-year plan in the near future? 🙂 It sounds like kind of a huge thing to tackle! Yes! That is coming in the Life Architecture Program we are working on. 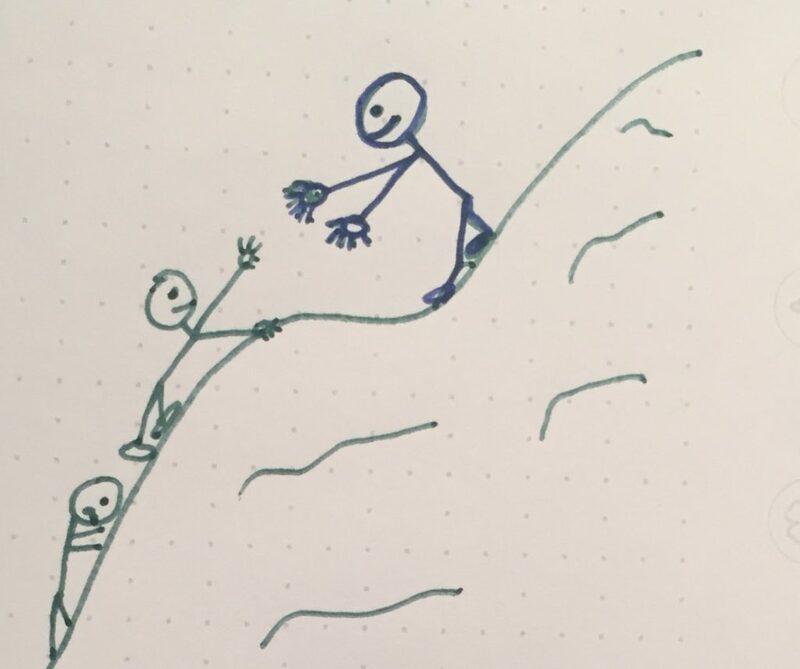 🙂 It’s Eric’s love to help people architect their lives. (And we know it seems strange to use “architect” as a verb, but that’s how we do it here…) So glad you are with us! Beautiful vision April! There are many days when I just feel life has passed me by and no progress on been made on the long term much less the plan for the day. Fully incorporating STEP in my life will help but I need to follow through and also have a vision to work towards. Love the work you do and the stewardship you already do to bring us all along with you. Thank you and Eric for all that have done for this community! Made my day! Thank you so, so much, Rachel! Keep up the great work with STEP! Hearing Eric talk just a little about Life Architecture during Step Live was what really pushed me over the edge to join STEP. I got ALOT out of both the free on line class. Then I watched all the STEP Live videos and it really made me feel like I could do this, but couldn’t really afford the Mastery program. But once I heard Eric talking about dreams and what I really want for my life and setting goals to get you there I realized that I don’t think about that. I go through life surviving one day at a time — not that that’s all bad, but I don’t have a clear vision of where I want to go. So then I thought that this program is about more than just where to put your papers – its about your life and I need this. So I took a leap of faith and I’m excited to see where it takes me! Thank you April and Eric for caring about us as people and not just “customers”. I am so happy to hear that!! Honestly, that’s what I love about the work here. If I was just teaching people to “organize offices,” I would get bored quickly. But because we’re working on getting organized so that we can create beautiful lives and strong families, I can’t wait to get up and get to work every day. 🙂 So, so glad you’re with us! And it’s funny, we never even use the word “customers” around here–even as we talk among our team members. It’s “community members” and “friends.” Way more fun (and meaningful) that way! So glad to have you here! You are my heroes. I am so excited about your growing again and adding another team member. I have never heard of anyone making a 50 year plan. I have been married nearly 47 years. I wonder how my life would have been different if I had actually planned any of it. I’m great at wanting something and setting a goal, but as for planning how to get there, well, not so much. I admire you both and can’t tell you how much I praise your processes and your organization. I’m so sorry your family won’t be together again until 2022. You know? That part of life will never again be the same. I’m a grandparent and am thrilled when all of us can be together on Christmas eve. I know these days are numbered because 2 of my 5 grandchildren are already living on their own. One in the Marines and one in college. Treasure your moments. My motto has become mind your moments because they become your memories. We need to think about how we act and react to things and make them moments we want to remember with joy and contentment. Ask yourself, “How do I want to remember this moment?” Then make it happen. I would love to learn how to create a 50 year plan step-by-step! Thank you for all you do for this LearnDoBecome community! All of the comments after the reply I added above , reading them has helped me to see that I am not the only one on Earth that struggles. My mind and personality is here there and everywhere.. … and my late husband was my “constant.” Now I have to learn to be my fun self but still become my own “constant.” I look foreard to my days ahead. Tha ks Eric and April for what you are teaching us/helping us to get a plan and action going! My husband and I were just today discussing—for the first time ever!—having retirement goals in order to give our todays more focus, regardless of whether we get there. I appreciate hearing this 50 year plan idea because it fill all the years in between! Love what you guys are doing and your big-picture mentality. God bless you! Alicia, We are so glad to have you with us, and how exciting you and your husband are making plans for a great future!!! Keep up the great work!!! April and Eric, thank you so much for this. I do have my command central up and running. I have been hovering around the Facebook page and enjoying reading everyone’s posts. I recently have begun to take my writing to the next step. I do have dreams. I have so many dreams that I want to fulfill before my time on Earth is done. To accomplish this, I am going to have to take my planning and organization to the next level. Thank you for helping me take that next step. Betty, We are thrilled to hear you are realizing your hopes and dreams! You can do this, and we would love to help encourage you along the way! Have fun with your writing, and we do hope you will stay close! Have a great week! Thank you for sharing your story, Maggie! We are so glad you have found inspiration, and we hope you continue to see your vision come to be in your home! We are here to support you in your journey! I enjoyed the picture of your family in the Old City, in part because I knew exactly where you were, just below the Temple Mount. We are glad to have you with us, Mike, and we are glad you enjoyed the post! Huge life impact! I have been incredibly helped through a webinar and then STEP live. I took notes like crazy, and set out implementing them. They help me every single day. Thank you, April & Eric!! 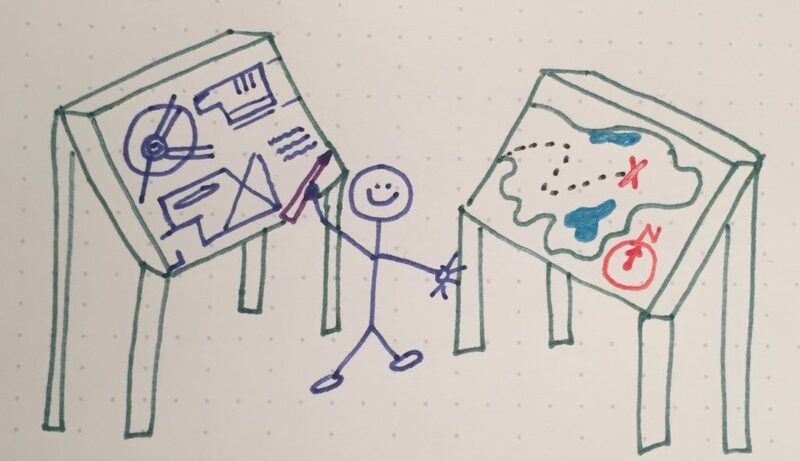 I LOVE this vision (and drawings!!) So well put! My husband and I are currently on Module 6, Step 6! Processing is AWESOME because I have a place to put the stuff I do want to keep!! I’m so happy! I’m 26 and expecting our third child in December and finally I feel like I am on a path to truly “be ready” before this baby comes! We run a busy busy life (husband is in Physical Therapy school, I teach Natural childbirth classes from home, we both run a home business together outside of all that) and I can already see how your STEP program is going to change our lives FOREVER! So grateful I found you at this early stage of my busy mothering life! Thank you so much, April! I love your drawings, and I love the content you produce. You help me have hope for the kind of life of impact and service and deep joy which calls to my heart but sometimes seems impossible when I am buried in the piles and “emergencies” of life without a solid system in place. I am returning to building my system after several attempts, and I find that each time I come back to your materials, I get more help from them in making my daily life run smoothly. Thank you for helping me and so many like me find our potential and free it–who knew it was hiding under the piles all along! April your drawings made me smile. They look like every picture I have ever drawn!!! I love adding illustrations to my work. I am interested in hearing more about what else STEP has to offer besides the office and project organization. I really feel I was able to do all that and more with the Mind Organization for Moms program and I revisited and refined it with the STEP Live, but wasn’t really sure what else the program had to offer beyond that. I have been going back and forth and I really want to learn more about the Life Planning etc. focus of STEP. I am wearing so many different hats!! Mostly, they are related to music and education. I love them all! I struggle however, to keep them all in order. All of my “jobs” have “homework”. I don’t like homework!! I want to be singing and playing and teaching and doing the fun things. It’s the daily stuff that I want to get a handle on. Thanks for your help and vision!! Love the “back of the napkin” drawings and the Ralph Emerson quote. I printed it and place it on my kids’ doors because at 10 & 12 they are not too young to find and follow their passion. Due to financial constrains I have not signed up for the program. However, I borrowed David Allen’s book from the library because you mentioned him in one of your sessions. And I have been watching some YouTube videos to help me organize. I am not where I want to be but I am not where I use to be either. I can see the top of my desk and that makes me feel good. Thanks for your inspiration. I love this post – it is so encouraging and inspiring! This week I have been feeling a bit down (seasonal blues perhaps?) and anyway, it seems that the STEP plan is about the only thing going right! 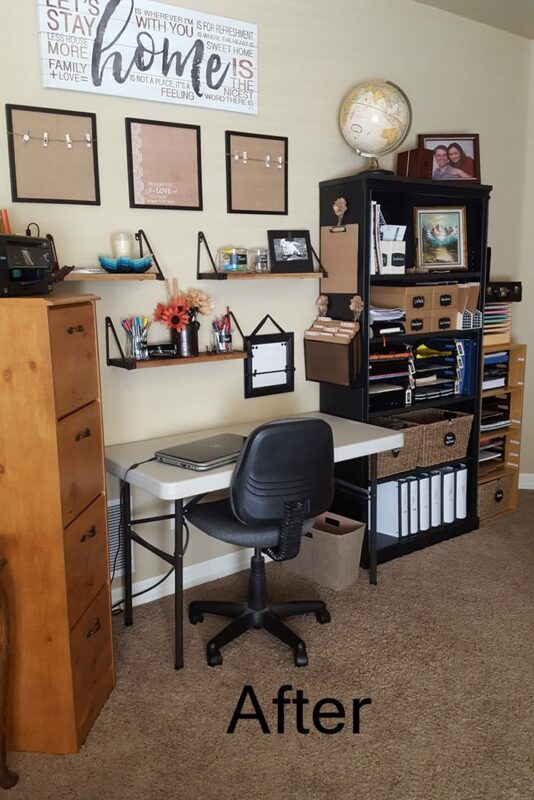 It’s nice to see organization happening – deep, good organization and not just the quick but temporary (or the hiding of the piles! LOL). I love having implemented the weekly review with my husband and we are working on our 5 year plans through that time right now. 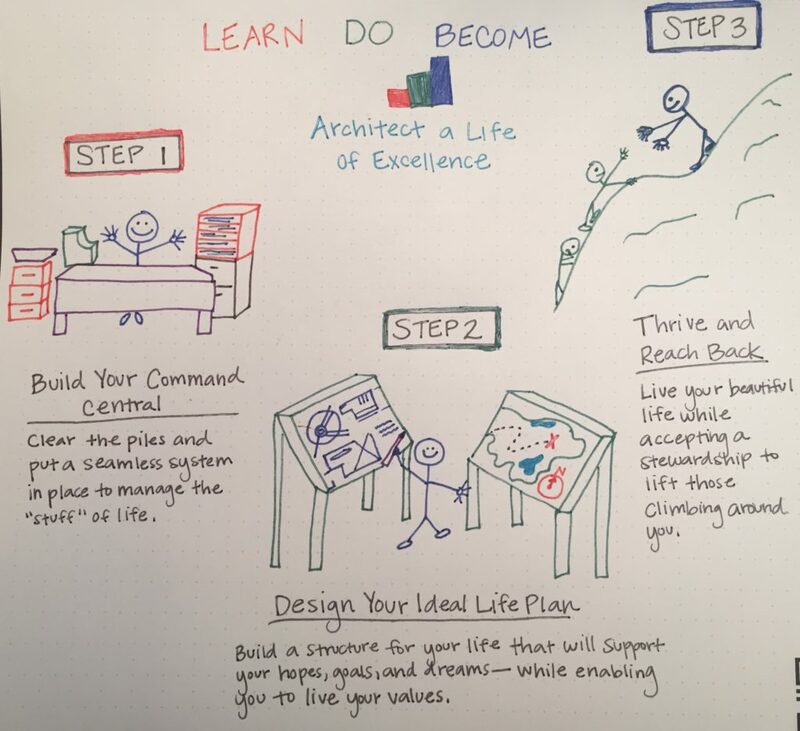 I can’t wait for the Life Architecture program to launch because I can imagine how much farther that will take us! I think this is probably my favorite before and after. I seem to get to Module 4 or 5 and get side-tracked, and then I get overwhelmed again (with my business). I have all the supplies, I just need to move forward, so I can really get my business up and going. This idea for the next step looks fabulous!!! Thank you for your kind words, Lynnell! We are so excited you are building such great characteristics into your life. Keep up the great work! Loving the concept. Very much in line with what I wanted to do for people through my counseling license. After being out of work for almost 3 years due to a pain disorder, I now need help getting myself and my world back together. I will be watching and reading all I can. We are so excited to have you with us, Tina! Best wishes as you move forward, accomplishing your goals along the way! We are glad to be a part of your journey! We are so glad that you found us and we would love to have you join us! Our hour-long class focuses on four simple steps anyone can use to get a better handle on life, home, goals, projects, and tasks. Find the time that works best for your schedule at http://www.learndobecome.com/STEP. We look forward to meeting you! Saying you changed my life sounds overdramatic doesn’t it..lol..But you did. I have been married for 15 years and my husband and I love each other very much. But I am a hoarder. Have been as long as I can remember. It has been a strain on our marriage and even though I knew I needed to do something… Nothing helped me, not therapy or more money or more family support. I had given up on my husband ever being able to invite his family over without being embarrassed. I don’t know how your system of filing papers changed my way of thinking. 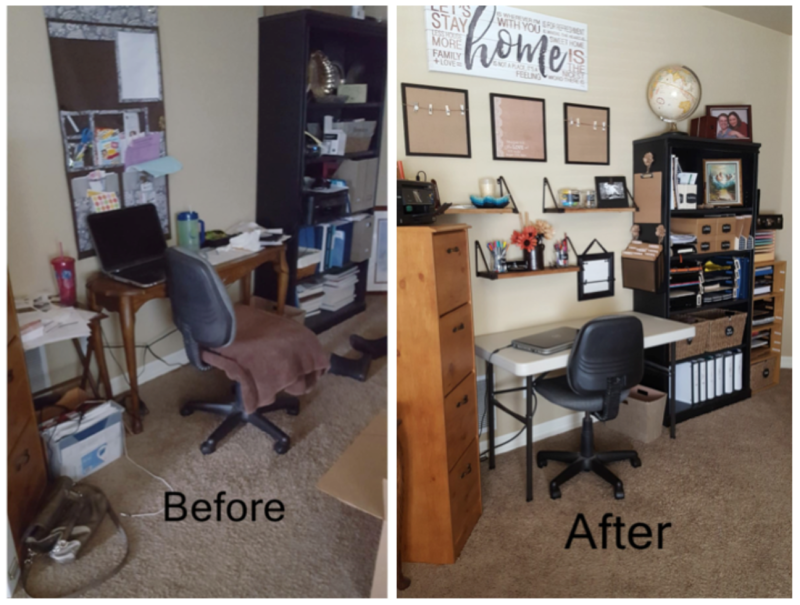 I don’t know how that one clean desk turned into doing the dishes or emptying the trash or opening the dreaded bill envelopes and being able to sit down with my husband to create a budget. My son has never had friends come over…we aren’t quite there yet, but I can see it in the future. I don’t know exactly why your STEP program helped me change the way I see things. The biggest change has been my relationship with my husband. 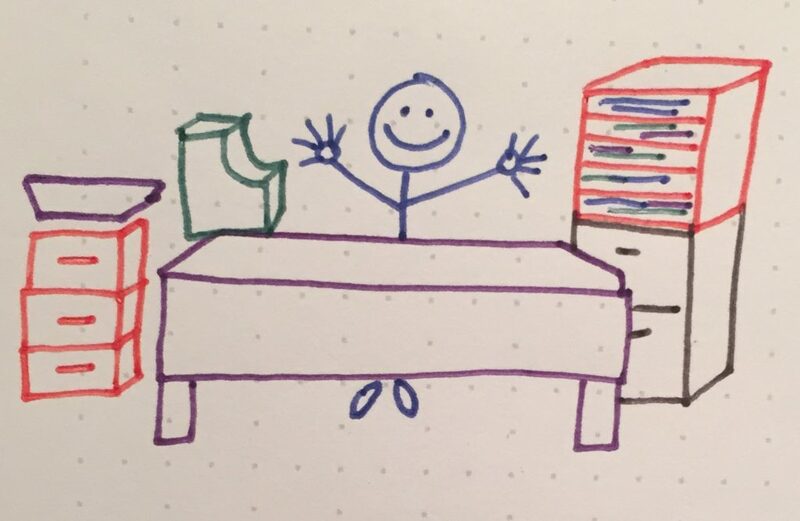 As I am overcoming my “hoarding tendencies” I feel more equal, like I’m finally becoming more of a helper and partner, instead of a hindrance or embarrassment. There is less stress in the house, and I feel closer to my husband and son. I feel like I was drowning in my own chaos and you helped me see the simplicity in things. I told you this would sound overdramatic..lol.. In a thousand small ways you will never know, you made me a better person, and it all started when you told me my first homework assignment was to clear off a space. I felt I could trust you, so I did. Lori, Wow. This is so incredible to read and such a gift to our entire team! Your story is truly inspiring, and we are so grateful for the time you took to share it with us! We look forward to hearing your continued success stories in the days ahead, and thank you for being a part of our community! I just wanted to thank everyone for the incredible energy you’ve added into the comments here! I’d planned to respond to more personally, but my mother passed away last week, and we are just getting back from her funeral. (See my Instagram account @aprilnperry to hear about the tender mercies God gave us along the way!) We are so, so happy you are all here, and we can’t thank you enough for your goodness and support of one another. Much love! Hi! I’m 52, & I’ve had a disabling/extremely fatiguing autoimmune condition since my 40th year. I’ve learned SO much about God’s faithfulness during this phase of my life. Now I believe I’m being called to share my story, starting with a blog (I’m a writer/editor by trade). That being said, my life is a complete mess. My piles have piles. I feel like I’ll take a year or more to sort through 12 years of stuff. Is it possible to clean & begin blog training at the same time? Or should I be careful with my focus, given my physical state? Actually, I just realized I’m probably thinking too far ahead. One step at a time. I look forward to learning more! Pamela, We are so glad you have found us and we look forward to seeing you achieve your goals. We would love to support you in your journey! I am new to all this, and taking baby steps. I realized as I read through everyone else’s posts just now a sense of hope and positive energy building in me. I already know how vitally important it is to take action from a positive emotional state (versus taking action from a negative state like frustration or feeling overwhelmed). I am now in a hopeful state and I’m ready for my baby steps of the day! Thank you, April & Eric (and all others who posted here) – you are an inspiration! Don’t give up! Just do a little at a time. You can build in breaks on your work time to do this and move forward at your own pace. I’ve been a member for aalmost a year and am just about through the modules.